Describe your experience with finding the perfect location for your PreWedding Session: Honestly, we had a great stress free experience choosing our session location. Our photographer, Rene, provided us with a list of beautiful indoor and outdoor locations, which was an extraordinary tool for us. For us, our wedding is in December, so we wanted to choose an indoor location for our wedding day portraits. Therefore, we figured we should definitely do an outdoor location for this session, so that way we have images with different styles. What are your recommendations/tips for couples before/during their PreWedding Session? : If you look good, you feel more confident and it shows in pictures - so ladies get your hair and makeup done and gentlemen make sure you have a fresh haircut! Another thing, black might be your favorite color to wear but honestly bright colors bring so much more life to photos, trust me! 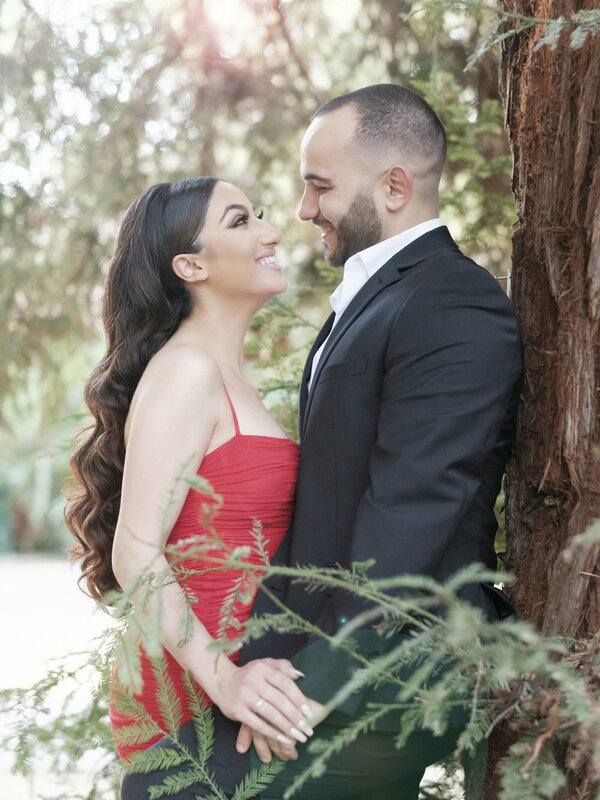 I think wearing red was a great decision for our shoot because I love how it made the photos pop more (another great tip from Rene’s team!). Something to keep in mind is, this is your time, and having your love captured before your big day, is really sentimental, you will always cherish these images. So have fun during your shoot, because it really is going to be a fun day! The more timid and tense you feel, the more it will shows in your photos, so just trust your photographer and have fun with the whole thing. Describe the moment he proposed: Well, almost every year we plan a trip with our group of friends to Las Vegas during the summer. So, we went to Las Vegas on June 23, 2017 and the following day we were getting dressed and had plans to go to a nightclub. The girls were all getting ready in our room and the guys were together in another. After we got ready, we started heading to my friend’s room to pre party and as soon as we got there, I opened my friend’s room door, the saw that the entire floor was covered in rose petals and candles. Then I found Derik on one knee waiting for me! We got engaged June 24, 2018. It was all water works from there, I was so incredibly shocked and happily surprised that I was shaking for a good ten minutes! The best part was, all of our closest friends had made the trip out and surprised me after. It was perfect, and more amazing than I can ever imagine. Interesting/fun facts about the couple or session: First things first, Derik was so much more comfortable and confident at our session than I initially thought he would be! About us, we have complete opposite personalities, I'm crazy & all over the place and he is calm & collected.